I’m pretty confident that you won’t have come across one of these puzzles before – I certainly haven’t! 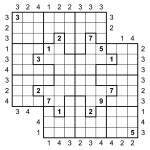 It’s a Samurai Skyscraper Sudoku puzzle with Jigsaw regions instead of regular 3×3 boxes. The aim is to place 1 to 9 into each row and column of each of the two overlapping 9×9 grids, and also place 1 to 9 into each of the bold-lined jigsaw pieces. On top of that, you must also obey the Skyscraper constraints, which are the numbers outside the main puzzle grid. They specify the number of digits you can ’see’ from each point, where higher digits obscure lower digits (so a 7 obscures 1 to 6, and a 9 obscures all other digits, for example) – see yesterday’s post for a slightly longer explanation of how these constraints work. This is an interesting puzzle! 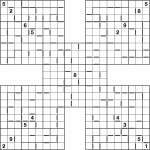 It’s similar to yesterday’s Gap Samurai puzzles, except that the 3×3 box regions have been replaced by jigsaw regions – and not only that, but also some of these regions stretch across the empty areas of the puzzle. Wherever you see a continuous row or column of 9 squares from a bold line to a bold line then you must place 1 to 9. Rows or columns that cross gaps have no restrictions (numbers can repeat on the other side of the gap). Jigsaw regions must also have 1 to 9 in. Those jigsaw regions without bold lines next to a gap continue on the other side of the gap, by following a direct line across the gap. They do not flow around to the left or right, but only straight across. 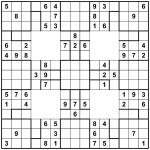 (If you’re familiar with Toroidal Sudoku, the regions connect in a similar way, except without actually wrapping around the outside of the puzzle too). If you’re still confused, and to clarify the regions further, count 4 across and 2 squares down from the top-left of the puzzle. This jigsaw region continues into the square below (obviously) and then across the gap to the square four below that (i.e. cross the gap whilst staying in the same column). It does not continue around the corner into the square that is 3 across by 4 down from the top-left – that’s part of a different region that continues in the centre of the puzzle (where the ‘8′ is, 8 across by 4 down). Returning to the first region, it then continues down to the ‘3′, and the ‘9′ and blank square to its right, and then down to the next square, across that second vertical gap, and then finishes in the two squares directly below (so that’s 4 across and 2/3 up from the bottom-left corner). PS None of the Samurai puzzles I’m posting require complex solving logic – just an organised approach! 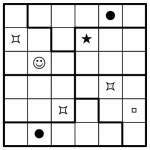 (So you don’t need to consider naked or hidden sets, or anything more complex, although of course they might occasionally help anyway – but you can solve these puzzles without them). PPS If you want to see solutions for any puzzles, just post a comment and ask! Also if you’ve solved one, please let me know how long it took – I’m interested to know!